The word ‘Nolen Gur’ is enough to make all Bengalis nostalgic. This Date palm jaggery is an intrinsic part of our (Bengali) culture and for some foodies like me, is synonymous to winter. We await the whole year to taste this seasonal delicacy and for us winter is incomplete unless and until this jaggery makes its appearance on our dining tables. Yes, we can have it with our breakfast, as an after lunch dessert, as part of something sweet with evening tea and for our must have lip smacking dessert after dinner. Go to any sweet shop and you will see all our famous sweets prepared with this jaggery. Be it the most famous Rasogolla (Cottage cheese balls simmered in light syrup), sandesh (cottage cheese fudge), Kanchagolla (softer version of Rasgulla), Jalbhara (Sandesh with juicy center) or bhapa sandesh (steamed Sandesh) every sweet in the shops take on a new avatar with the colour and the unique flavour borrowed from Notun gur. This slightly smoky and one of its kind jaggery smells unbelievable when paired in milk based desserts. Back home it’s a ritual for most of us to make those early morning walks to the nearby villages to drink this juice collected in the earthen pot throughout the whole night. In our ancestral house this is a must do affair. 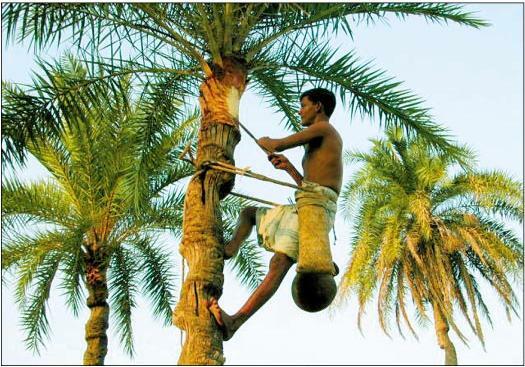 We have several date trees around our paddy fields and ponds and the collection process starts in the evening. First the earthen pots are disinfected by warming them on fire, then the sap is extracted and collected by a tapper. Typically the sap is collected from the cut flower of the tree. A container is fastened to the flower stump to collect the sap and left there all night. The white liquid that initially collects is very sweet.Every morning it is customary to gather around the ghat (sitting area around the steps leading to the pond) where the juice filled pots are carefully brought down. The juice is to be drank fresh, early in the morning, otherwise as the day progresses it starts to ferment and by evening it turns to toddy. 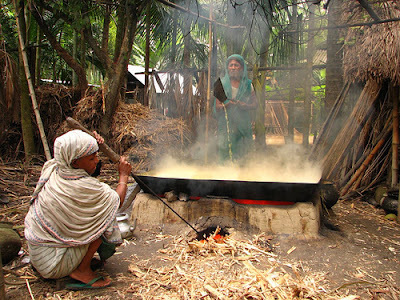 Apart from having the fresh juices, once or twice every winter more juices are bought from local suppliers to prepare jaggery. The juice is boiled in a huge flat metal pot called Shalti and is reduced till it thickens and takes a cake-y form called patali. Sometimes the gur is made to a syrup-y form called Jhola gur. My boro jethi or eldest aunt makes a very flavourful patali with fresh ginger, black pepper and dry roasted Bengal gram…which we love to have with another Bengali snack called chalbhaja (a variety of puffed rice). As far as am concerned I can plan all four of my meals around this jaggery. Starting and finishing the day with this delightful taste of nalen gur. Baba dint get anyone this winter to send us some Nolen gurer sandesh but both hubby and I were craving for it badly. Finally decided to try my hand in this very soft sandesh making. This is the first time that I tried it and truly proud to see the great results. Trust me on this when I say this is exactly what we get in the shops and by that I don’t only mean the look or the shape but the taste, colour and texture are exactly like the store bought ones. and the best part is it is as easy as counting 1-2-3. once you have made the cottage cheese, you are only 15 minutes away from this blissful dessert. First you need to make the cottage cheese. For this bring the milk to a rolling boil and pour the lemon juice. Mix and stir. The milk will curdle, keep on boiling till a clear whey separated from the cheese. Pour this in a muslin cloth and wash under running water to get rid of the lemon-y smell. Tie the loose ends of the cloth and hang to drain all the water. Do this for an hour and then place the cottage cheese on a plain surface (I placed it on the back of an inverted steel plate) and press with something heavy (I used my shilnora or the stone mortar and pestle). After another hour take this cheese in a flat plate. And start kneading with the heal of your palm. Once the cheese becomes smooth (approx 5 minutes) add the sugar and again knead till all the sugar melts in (another 2-3 minutes). Finally add the jaggery before kneading the dough for another couple of minutes. Take this in a non-stick pan and on very low heat cook this for 3-4 minutes. Do this by stirring the dough continuously. Don’t panic if you find the dough little soft, it will harden as it cools. 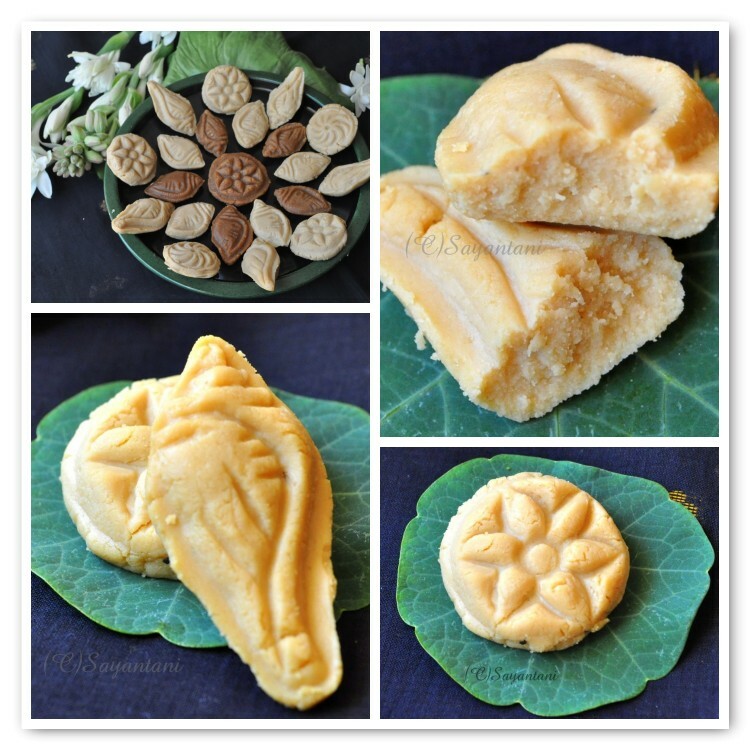 To give shape to the sandesh use the stone or terracotta moulds. Brush the inside of the mould with little oil or ghee (clarified butter) and press little bit of the dough to transfer the design. Serve whatever way you want warm, cold or at room temparature, this delightfully light dessert will make you speechless with every bite. Those of who want to try it at home but dont get Khejur gur here is another tasty option. Make this Aam Sandesh. similarly you can use strawberry as well. The texture of this Aam sandesh is different and not as soft as the jaggery one. Do not cook the mixture more than 3-4 minutes if you want a soft and melting in the mouth texture. If cooked for long it will become comparatively hard and little chewy, that is another form of this sandesh called Kara Pak. I tried this (with 8 tbsp jaggery) and the result is the black ones. Hubby liked it but the rest of us were bowled over by the soft ones. Store in covered container in fridge, this stays good for 2-3 weeks if kept properly. If you dont get this particular jaggery use kesar to make normal sandesh. Sending this to Aliena's Delicious Dessert hosted at What's Cooking today. Sending this to Rumana's treat to Eyes; Series 2. 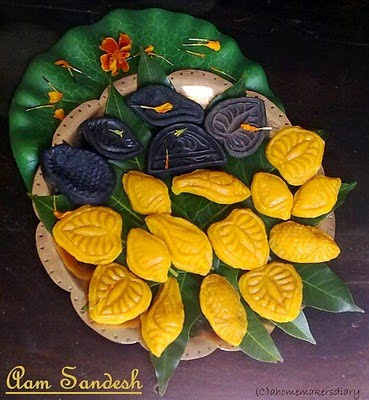 Bangali Mishti, How to make bangali misti, best bangali misti, best bengali sweets, authentic bengali dessert recipes, traditional bengali sweet recipe, how to prepare sandesh, sandesh making, nolen gur, notun gur, khejur gur, nalen gur, patali gur, jhola gur, bengali gurer mishti, bengali jaggery based dessert, winter special, bengali winter delicacy, winter speacial dessert, khejur ras, what is khejur ras, khejur gur recipes, narom paker sandesh, kara paker sandesh, talshaansh, jalbhara, jolbhora, gurer sandesh, soft cheese fudge, Indian sweets, indian cottage cheese fudge, chhana, chhena, how to prepare chhana, chena, chena recipe, chena sweets, cottage cheese based dessert.East Indian delicacies. mmm....delicious recipe...droooooooooling here Sayantani...fascinating clicks again..
traditional sweets are always a treat! these look so cute and pretty. By the way whenever i read or hear abt palm gur, i remember Amitabh's some old film. I hope this will change to your blog !! @Sharmila, thank you. gol gol banale nolen gurer kancha golla'r moto dekhte lagbe kintu taste to aki thakbe. betweeb ogulo nasturtium er pata. ki sundor na? @SE, yes thats the movie Saudagar, beautiful movie. thanks for your complements. they look so amazing...love the shapes...so decorative!! A real treat..so cute and delicious sweet..all your sweets make me drool. Very informative post. Sandesh looks so inviting. Lovely presentation and that sandesh makes me crave. 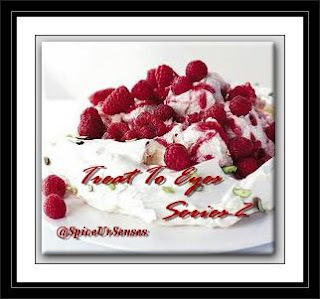 Your blog is an encyclopedia for me to try new desserts. Keep up the good work dear. Delicious sweet, nice explanation and awesome clicks too. Now I know who you bongs are so sweet :-) All these Sondesh n Rosogolla is the secret ... The sondesh you made looks like the store bought one .... so perfect n delicious. Tumi akebare kapiye diccho!Roj notun notun Post. Nolen gurer shondesh dekhe khub khete icche korche. Bangalore thekeo amra akhon obdi dekha korte pari ni. Onek notes exchange korte hobe. This looks scrumptious. Thanks for the lovely comments on m blog. I must thank you so much. You bring back so many authentic Indian sweets to me. Great post, Sayantani..Sandesh looks so so perfect and tempting! Never tasted this before but I am sure it tastes heavenly!! Beautiful pictures as always..
Wow, I have never seen sandesh with gur, where do u get the mold in India- is from ur home town? Lovely reading your post and a mouthwatering milk sweet,you have made it beautifully. Very craving sondesh Sayantani!! Can you suggest one thing, I might not get nolen gur here in UK, will the normal jaggery bring the same results? the sweets look so cutely shaped and lovely, if u don't mind please send me some O.K? Lovely and yummy sandesh,soo inviting..
mmmmmmmmmmmmm that looks totally yumm and my mouthwaters.. i have bookmarked it. This is so intriguing! The color is fab, the pattern is beautiful, the texture is perfect and I bet they were tasty as well..Loved the post n the beautiful pics Sayantani..
@Viki, thats a great complement, thanks dear. @Satrupa, secretly telling you am Oriya by birth. @Deepa, akdom thik. bari jachhi fire akta meet plan kortei habe. @Cham, yes I bought the moulds from Bengal. acquiring these are quite difficult these days and I got mine from a remote village in Midnapore. @Preeti, Go ahead make some with normal jaggery. I never tried so have no idea of the outcome. it would be tasty for sure but with different texture and aroma. Those are lovely little sweets. Excellent write up, with detailed information of our beloved notun gur. For us migrant Bengalis it is something we can only dream about. Once again you have written a wonderful piece with nice pictures. I once again drop the idea of doing a piece on the gur. Homemade sandesh is real tasty, my mum made it quite often, I too tried my hand at it once, it is quite simple but the quality of milk has to be good. I love the kheer made with khejur gur.Your sandesh looks sensational! Nolen Gurer Sandesh, Rajnigandha and tomaar post...aar ki chaai Bangaleer! Beautiful is the word. Aami tomaar recipe ta dekhe banabo sandesh. Khub shundor. beautifully presented...pass me that platter please :) yummy!!! @Indrani, Thanks a ton. banie bolo kamon holo. @Shilpidi, amar write up bhalo legeche jene khub anondo hocche. but am sure if you write that would be much much better. please akta post lekho amader nolen gur nie. @Pree, banao tabe jato knead korbe tato soft habe. banie bolo kamon holo. @Sanju, thanks a lot for your beautiful comment. am glad that you made and liked the pithe recipe. the credit only goes to you as you are the one who made it perfectly. Hi! This is a second post that I am reading on this jaggery and Sandesh and I have loved reading the detailed posts. Both the versions look great and personally would love to try the softer one. looks beautiful, did'nt know the story behind it was so interesting. Yours is simply beautiful,love those molds!! Love your sweets....excellent explanation and presentation!! pithey, shondesh .. ki kando korecho?!! the drawbacks of living in US is majorly missing out on these. I have no idea when I had the last noelr guler shondesh. ar tomar shondesh ki shundor perfect shape. The sweet looks perfect and nice photos.. These are works of art! :) I have had the pleasure of being introduced to these sweets after moving to Delhi since C R Park which is a Bengali stronghold is just metres away - they taste divine! Hey Sayantani tumi kobe phircho? Hotath kore gele....Shob theek ache toh? Oh my god,tumi eigulo baniyecho ? Baap re..You are an expert Sayantani..Opurbo dekhte hoyeche..Awesome job !! nice blog there is an award waiting 4 u in my blog come and grab it. Hello Sayantani. I've often wanted to leave a comment because on your blog I see recipes that my family stopped using pretty much after they left Bangladesh (chalkumror pata diye paturi for one, noksha bori for another), and since my grandmother and great-aunts fell ill the tradition of making everything from goja to rosh-puli (I think most people call it puli pitha or dudh-puli) has all but stopped. You blog is like pages out of my life's album. But as wonderful as that is, I'm writing today about something else. I couldn't find your email address on the blog, but I'd love to talk a little bit more about your post Amader Haat. It's related both to my work and research, and I'd appreciate a chat. If you have the time, would you please drop me a line? Oh man...thats very tempting...looks awesome' love the tradition there'...thanks for sharing the info' plus beautiful pictures. its absolutely awesome...wonderful effort there!! Awesome presentation!! Looks same as if not better than the shop made variant. Yummy sweets and great clicks.. I would love to pass two awards to you.. Do drop by my space to collect the awards. @Rimi,have sent you my mail at your comment page. also updated my homepage with the id. hope it helps. @Ramya, thanks for remembering me dear. you truly deserve these and more for the magnificent work you put up on your blog. AJ hatat dekhlam tomar blog-e asa hoeni ek mas. Tai Ilish machher PatuDI theke backward poD-te poDte ekhane elam. Posh parban darun korechho...AMi gokul pithe ar puli pithe banye chhilam. Bhalo theko..I will be off blog for some time. long time wish to try the sweet sandesh,soon have to try,your version is looking very nice! I have visited your blog for the first time.. 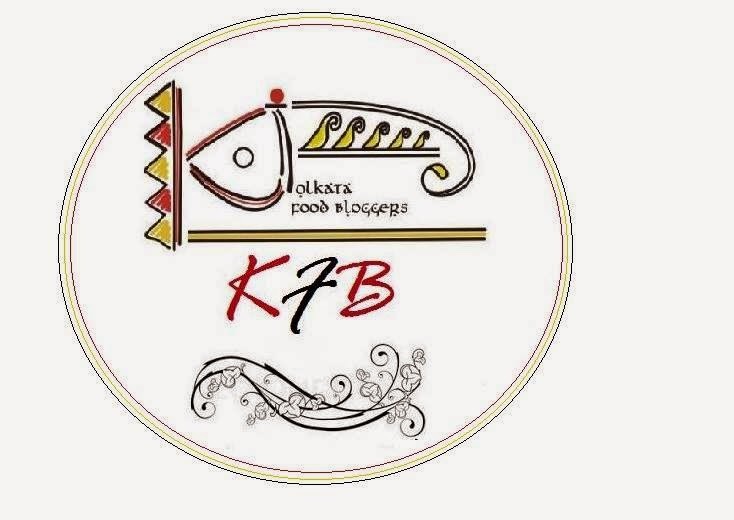 It is really an awesome blog with lots of Bengali flavor.. Nolen gurer sandesh dekhe chhotto belar kotha mone pore gelo, ahaa!! mukhe jal ese gelo.. Perfect and beautiful looking sandesh! !Love the way u presented!! 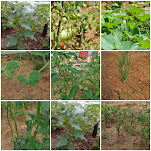 Awards for you..please visit my blog and collect them. How are you? Its been long time since I last visited your blog...ofcourse missed great dishes from you..
My mouth is watering looking at these incredible sweets you have made...ahh..just awesome. My favorite nolen gurer sandesh. I have shared an award with you. Sandesh look perfect, just like store bought..I feel like having some right now..
Sayantani, where are you? Notun post dekhchi na. 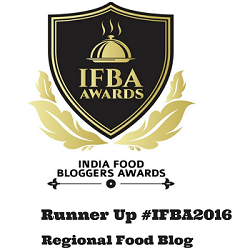 Anyway, Reshmi of Easy Cook gave me two awards and according to the rules I am supposed to share it with 15 bloggers, as most of you have won awards I thought I will draw attention to some your posts so while sharing my awards with you I have also given links to some of your posts which have attracted my attention. If you like you may collect the awards. Colourful and beautiful post.Craving for Sandesh NOW! Oooooh! I love these! I'm feasting on them at the Sweet Bengal eateries here! I must, absolutely must try your recipe. They sell the gur as well! I am first time here.Your blog is so nice,this traditional recipe is wonderful and delicious. Hi Sayantani,tumi bangalore a bose ki kore go nolen gur pele?kolkata theke anecho naki?blore kothay pete pari janio pls.r tomar chele bhison cute.plss janio.r tumi to akjon avid baker to pls blore a kothay baking supplies pete pari pls update koro.- RAJASREE FROM BANGALORE. Fabulous piece of Sandesh...looks like a piece of heaven.Loved the shapes. Khub bhalo laglo lekhata pore o pic gulo dekhe, they loook really like the authentic ones! well done! I have sent you an email today to your yahoo account, please do take a look. tomar sandesh er recipe ta follow kore sandesh baniyechilam. exactly follow korlam but sandesh ta sticky holo..ki bhul korechi bole mone hoy tomar? ami aboshsho gur paini bole vanilla flavor dilam... ektu janabe please... tomar blog ami regular follow kori. porte bhalo lage. keep it up. @Mekhala, sorry sandesh ta sticky hoeche bole. tumi likhecho gur paoni tahole ki purotai chini die korechile ta jodi hay tahole to narom paak er moto ranna korle habe na. purota chini die mishti korle je poriman chini lagbe seta to ektu beshikhon ranna korte habe. chini gole chanar jol er sange mishe gele chatchate hoe jete pare. secondly tumi jehetu chini diecho asha kori chinita chana makhar somoy tei mishiecho. koray chini ar chana meshate gele kintu chini sticky kore debe puro byapartake. thirdly chanay jol theke geleo tai hote pare. Sorry again and hope this helps. Sanyantani is there a place in Kolkata that we can buy this gur? Thanks! @Shri, as i mentioned in the post this gur is highly seasonal. best quality is available only during December and January. Almost everyshop sell it during the season but many are fakes. best is to ask someone from your locality to point out a trustworthy seller. but am not sure if you are actually from Kolkata, you can also try the makeshift shops that sell Jaynagarer moa (a puffed rice laddu kind of sweet) during this time. they generally have their shops on the street pavements. hi Sayantani!tried ur recipe of nolen gurer sandesh twice and the result was fantastic both the time.Hubby thought it was store bought. Thanks for the wonderful post and keep up the good work. Hi Sayantani!Tried ur recipe of sandesh twice and the result was awesome both the times.hubby thought it to be store bought. thanks a lot and keep up the good work. Thanks Indrani for trying my recipe. so so so glad that you all liked it. cant thank you enough for letting me know. buy best quality saffron at your door step. kesar is good for health and this best for pregnant women for his child. kesar is Indian name of saffron. could аѕsume you're an expert on this subject. Well with your permission let me to grab your feed to keep up to date with forthcoming post. Thanks a million and please continue the enjoyable work. Is the gur supposed to be powdered or how does it work? is the gur to be powdered before use or how does it work?